Staten Island Commercial Rezonings. Used with permission of the New York City Department of City Planning. All rights reserved. Amendment restricts residential- only development in commercial districts. The City Council rezoned three areas of Staten Island and approved a text amendment to insure lower density commercial development in portions of the borough. The three areas rezoned are located along Castleton Avenue, New Dorp Lane, and Arthur Kill Road. The Planning Department initiated the rezoning proposals and text amendment in response to recommendations made by the Staten Island Growth Management Task Force. 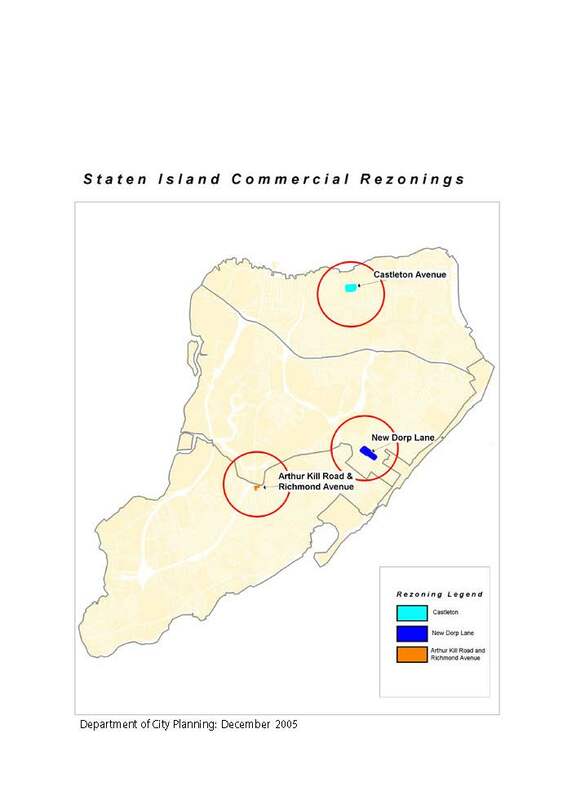 After finding that Staten Island’s commercial areas were overdeveloped with residentialonly projects, the task force identified three main goals: discouraging inappropriate residential development, encouraging appropriate commercial development, and encouraging Staten Island’s legacy of town centers. The approved Castleton and New Dorp Lane actions primarily replaced C4-2 districts with R3-2 districts, including commercial overlays on a total of 14 blocks. The actions also preserved the neighborhoods’ character by limiting purely commercial buildings to two stories, prohibiting ground floor residential units, and setting a 35-foot maximum height for mixed-use buildings. The Arthur Kill/Richmond Avenue action down-zoned two commercial districts (C2-1 and C2- 2) to conform with surrounding R3- 2 zones. Also, adjoining R3-2 and C4-2 districts were rezoned to create a large C4-1 district bounded by Ridgewood Avenue, Gurley Avenue, Getz Avenue, and Arthur Kill Road. The large C4-1 district will be subject to the newly adopted text amendment that prohibits residential- only development and requires that mixed-use development utilize ground-floor space exclusively for commercial or community facility use. In addition, the text amendment prohibits as-of-right residential use on blocks that are four acres or larger and sets requirements for streetwall conformity, commercial floor area, curb lines, landscaped buffers, street trees, and parking. At the Council’s December 15, 2005 Subcommittee on Zoning and Franchises hearing, all four proposals were approved. The full Council approved on December 21, 2005. ULURP Process: The Planning Commission, as lead agency, issued negative declarations on all four applications. Community Board 1 approved the Castleton plan, Community Board 2 approved the New Dorp Lane proposal and Community Board 3 approved the plan for Arthur Kill and Richmond Avenue. All three Staten Island Community Boards approved the text amendment. Borough President James P. Molinaro approved the rezonings on October 5, 2005 and the text amendment on October 18, 2005. Commission hearings were held on November 2, 2005 and continued on November 16, 2005 for the Castleton application. Property owners spoke in opposition of the New Dorp and Castleton rezonings, arguing that their current development plans would become infeasible. The Commission approved all four applications on December 7, 2005. At the vote, Commission Chair Amanda M. Burden commented that the Commission must preserve the neighborhoods’ character. Commissioner Angela R. Cavaluzzi added that Staten Island’s diversity should be protected and storefront areas should be revitalized. Commissioners Alfred C. Cerullo, III and John Merolo, both Staten Islanders, approved enthusiastically.